عالم‌زاده, شاهین, احمدی گیوی, فرهنگ, محب‌الحجه, علیرضا, نصراصفهانی, محمدعلی. (773). تحلیل دینامیکی‌–‌آماری اثر متقابل نوسان اطلس شمالی (NAO) و نوسان مدن-جولیان (MJO). مجله ژئوفیزیک ایران, 7(4), 64-80. شاهین عالم‌زاده; فرهنگ احمدی گیوی; علیرضا محب‌الحجه; محمدعلی نصراصفهانی. "تحلیل دینامیکی‌–‌آماری اثر متقابل نوسان اطلس شمالی (NAO) و نوسان مدن-جولیان (MJO)". مجله ژئوفیزیک ایران, 7, 4, 773, 64-80. عالم‌زاده, شاهین, احمدی گیوی, فرهنگ, محب‌الحجه, علیرضا, نصراصفهانی, محمدعلی. (773). 'تحلیل دینامیکی‌–‌آماری اثر متقابل نوسان اطلس شمالی (NAO) و نوسان مدن-جولیان (MJO)', مجله ژئوفیزیک ایران, 7(4), pp. 64-80. عالم‌زاده, شاهین, احمدی گیوی, فرهنگ, محب‌الحجه, علیرضا, نصراصفهانی, محمدعلی. تحلیل دینامیکی‌–‌آماری اثر متقابل نوسان اطلس شمالی (NAO) و نوسان مدن-جولیان (MJO). 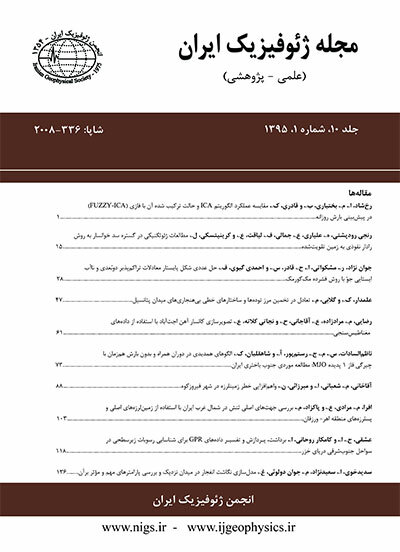 مجله ژئوفیزیک ایران, 773; 7(4): 64-80. نوسان اطلس شمالی (NAO) و نوسان مدن-جولین (MJO)، بخش‌های وسیعی از نیمکرۀ شمالی زمین را تحت تأثیر قرار می‌دهند. با بررسی برهم‌کنش متقابل آنها و با داشتن اطلاعات کافی از هریک، می‌توان فاز و شدت دیگری را پیش‌بینی کرد. بررسی آماری و دینامیکی رخدادهای NAO و MJO بحرانی زمستان نیمکرۀ شمالی در دورۀ 37 ساله (1974-2011)، رابطۀ قابل‌‌توجهی بین این دو پدیده را نشان می‌دهد. در روش آماری، محاسبۀ شاخص میانگین NAO به تفکیک فازهای MJO و با تأخیرهای 5 تا 25 روزه، حاکی از رابطۀ علت و معلولی بین این دو پدیده است. برای بررسی دینامیکی اثر NAO بر MJO، نقشه‌های ترکیبی تأخیری بی‌‌هنجاری باد مداری تراز 200 هکتوپاسکال و بی‌هنجاری تابش موج بلند خروجی (OLR) به تفکیک فازهای فرین NAO و برای تحلیل اثر MJO بر NAO، بی‌هنجاری تأخیری ارتفاع ژئوپتانسیلی تراز 500 هکتوپاسکال به تفکیک فازهای MJO به‌دست آمده است. 20 تا 25 روز پس از فاز مثبت (منفی) بحرانی NAO، فاز 7 (3) MJO دیده می‌شود. این اثر NAO بر MJO با ایجاد تغییر در بی‌هنجاری باد مداری تراز 200 هکتوپاسکال و نیز بی‌هنجاری OLR در عرض‌های حاره‌ای از اقیانوس اطلس تا اقیانوس هند به تفکیک فازهای بحرانی NAO همراه است. تحول زمانی الگوی بی‌هنجاری باد مداری تراز 200 هکتوپاسکال و جهت انتشار این بی‌هنجاری‌ها در روزهای پس از فاز مثبت (منفی) NAO با تحول زمانی و جهت انتشار بی‌هنجاری OLR همخوانی بسیار دارد. بنابراین به نظر می‌رسد که اثر NAO بر همرفت MJO از راه القای تغییرات باد مداری تراز بالای جوّ تا اقیانوس هند منتقل می‌شود. ازسوی‌دیگر، 5 تا 15 روز پس از فاز 3 (7) بحرانی MJO، NAO به فاز مثبت (منفی) می‌رود. این اثر MJO بر NAO، با جهت‌‌گیری‌های متفاوت قطار امواج راسبی و در نتیجه شکست موج متفاوت در امریکای شمالی و اطلس شمالی به تفکیک فازهای 3 و 7 از MJO بحرانی قابل مشاهده است. Vast areas of the Northern Hemisphere are influenced by the North Atlantic Oscillation (NAO) and the Madden-Julian Oscillation (MJO). Revealing the interaction between them can help us predict the phase and amplitude of each one based on the conditions of the other.Statistical-dynamical study on critical events of MJO and NAO during the Northern Hemisphere winter in a 37-year period (1974-2011), reveals a considerable connection between NAO and MJO. In a statistical method, the computed mean value of NAO index for different phases of MJO associated with 5 to 25-day lags, showed a causal relation between the two phenomena. Phase 7 (3) of MJO was observed 20 to 25 days after the positive (negative) phase of NAO. On the other hand, 5 to 15 days after phase 3 (7) of MJO, positive (negative) phase of NAO occured. Lagged composite maps of 200-hPa zonal wind anomaly and the outgoing long-wave radiation (OLR) anomaly were computed for different phases of critical NAO in order to analyze the dynamical impact of NAO on MJO. Within 5 to 25 days after the positive NAO, maximum 250-hPa westerly anomalies in the Africa-Asia jet region propagate eastward from Africa to central Indian Ocean. On the other hand, OLR anomaly patterns propagate eastward in the same period and same region after the positive NAO that might be induced by the propagation features of 250-hPa zonal wind anomalies. On the 25-day lag relative to the critical positive NAO, both 250-hPa westerly anomalies over the central and eastern Indian Ocean and the development of positive OLR anomalies in the same region were consistent with the conditions of phase 7 of MJO. However, on the 5 to 25-day lags relative to the critical negative NAO, 250-hPa zonal wind anomalies showed the attenuation of the westerly Africa-Asia jet leading to the favorable conditions for evolution of the easterly anomalies over the Indian Ocean. On the other hand, the OLR anomaly patterns displayed either little or no westward propagation. On the 25-day lag relative to the critical negative NAO, the development of both 250-hPa easterly anomalies and negative OLR anomalies over the central Indian Ocean corresponded to the conditions of phase 3 of MJO. Lagged composites of 500-hPa geopotential height anomaly for different phases of MJO were also computed in order to analyze the dynamical impact of MJO on NAO. On the 5 to 15-day lags relative to phase 3 of MJO, a Rossby wave train was observed over the Pacific Ocean extending to the North America and Atlantic region. The waves were oriented in the South West – North East direction. On the 10-day and 15-day lags, the waves started to gradually break anticyclonically over the North America and North Atlantic regions. On the 15-day lag, a dipolar pattern formed in the Atlantic region associated with a negative anomaly center of 500-hPa geopotential height in the northern part of the North Atlantic and a positive anomaly center in the central part of the North Atlantic, leading to the formation of the positive NAO phase. On lag days after phase 7 of critical MJO, a similar wave train was also extended from the Pacific and North America to the Atlantic region; however, the orientation of the waves was South East-North to West at this time. On the 5 and 10-day lags, a cyclonic wave breaking was observed over the North America and North Atlantic regions. Ultimately, on the 10-day lag a dipole structure similar to the negative NAO phase was formed over the North Atlantic region. نصر اصفهانی، م. ع.، 1388، بررسی اثر NAO و MJO بر اقلیم جنوب غرب آسیا: رسالة دکتری هواشناسی، مؤسسة ژئوفیزیک دانشگاه تهران. غضنفری لاکه، ا.، 1388، مطالعة موردی توزیع رطوبت و بارش بر روی کشور در زمستان 1386 و ارتباط احتمالی آن با همرفت MJO: پایان‌‌نامة کارشناسی ارشد هواشناسی، مؤسسة ژئوفیزیک دانشگاه تهران. Benedict, J. J., and Lee, S., 2004, Synoptic view of the North Atlantic Oscillation: J. Atmos. Sci., 91, 121-144. Kalnay, E., Kanamitsu, M., Kistler, R., Collins, W., Deaven, D., Gandin, L., Iredell, M., Saha, S., White, G., Woollen, J., Zhu, Y., Chelliah, M., Ebisuzaki, W., Higgins, W., Janowiak, J., Mo, K. C., Ropelewski, C., Wang, J., Leetmaa, A., Reynolds, R., Jenne, R., and Joseph, D., 1996, The NCEP/NCAR 40-Year Reanalysis Project": Bull. Amer. Meteor. Soc., 77, 437-471. Lin, H., Brunet, G., and Derome, J., 2007a, Intraseasonal variability in a dry atmospheric model: J. Atmos. Sci., 64, 2422–2441. Lin, H., Brunet, G., and Derome, J., 2009, An observed connection between the North Atlantic Oscillation and the Madden-Julian Oscillation: J. Climate., 22, 364-380. Matthews, A. J., and Kiladis, G. N., 1999, The Tropical-Extratropical interaction Between high-frequency transients and the Madden-Julian Oscillation: Mon. Wea. Rev., 127, 661-667. Matthews, A. J., and Kiladis, G. N., 2000, A model of Rossby waves linked to submonthly convection over the eastern tropical Pacific: J. Atmos. Sci., 57, 3785-3798. Matthews, A. J., 2008, Primary and successive events in the Madden-Julian Oscillation: Q. J. Roy. Meteorol. Soc., 134, 349-453. Wheeler, M. C., and Hendon, H. H., 2004, An all-season Real-Time Multivariate MJO index: Development of an index for Monitoring and Prediction, Mon. Wea. Rev., 132, 1917-1932.